Christmas is coming – so Nicholas Duck puts on his Santa suit and proudly starts gathering wish lists. But this year, his little brothers and sister want to help. Nicholas isn’t too keen on the idea, especially when the little ducks start trying to outdo each other by promising the most outlandish gifts! 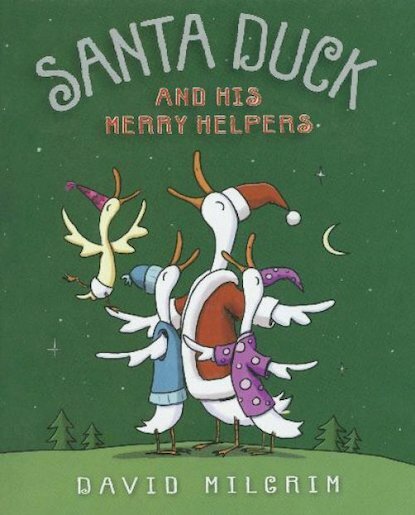 The Hoover Dam for Beaver, a castle for Frog… it’s not long before Santa Duck is fed up. But as he tries to explain to his siblings what Christmas is all about, it turns out that they have a thing or two to teach him about working together… With its comical text and cute illustrations, this story will get kids chuckling as they celebrate the spirit of the season with Santa Duck!